Enjoy the best price on the web, when you buy your 1 g 2018 Chinese Panda Gold Coin from our shop today. This anticipated coin is the latest in the popular Chinese Panda series, issued by The People’s Republic of China since 1982 to celebrate the arrival of each new year. The giant panda is the focus of each year’s changing reverse feature and this year’s edition depicts an adorable friendly giant, contemplating his food of choice, a shoot of bamboo. Also on the reverse you’ll notice the weight of the coin, which, since 2016, has been stamped in metric to accommodate the global market; as well as the coin’s purity and face value of 10 Chinese Yuan. The obverse design, unchanged since the series’ inception, features a beautifully detailed view of the ‘Hall of Prayer for Abundant Harvests’ at Beijing’s ‘Temple of Heaven.’ In a wide border encircling the feature, you’ll see the legend of ‘The People’s Republic of China’ cast in Chinese characters; as well as the year of issue, which is 2018. Enrich your holdings with a piece of this beloved yearly tradition and invite a 1 g 2018 Chinese Panda gold coin into your home today. 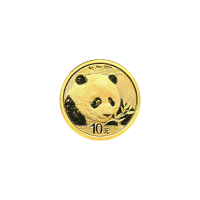 1g 2018 Chinese Panda Gold Coin Enjoy the best price on the web, when you buy your 1 g 2018 Chinese Panda Gold Coin from our shop today. This anticipated coin is the latest in the popular Chinese Panda series, issued by The People’s Republic of China since 1982 to celebrate the arrival of each new year. The giant panda is the focus of each year’s changing reverse feature and this year’s edition depicts an adorable friendly giant, contemplating his food of choice, a shoot of bamboo. Also on the reverse you’ll notice the weight of the coin, which, since 2016, has been stamped in metric to accommodate the global market; as well as the coin’s purity and face value of 10 Chinese Yuan. The obverse design, unchanged since the series’ inception, features a beautifully detailed view of the ‘Hall of Prayer for Abundant Harvests’ at Beijing’s ‘Temple of Heaven.’ In a wide border encircling the feature, you’ll see the legend of ‘The People’s Republic of China’ cast in Chinese characters; as well as the year of issue, which is 2018. Enrich your holdings with a piece of this beloved yearly tradition and invite a 1 g 2018 Chinese Panda gold coin into your home today.